We've picked out ten of the best Christmas trees. Take a look at our choice of quality, unique trees, many at bargain prices. Whatever your preference this Christmas, hopefully you'll find the perfect tree for you. Our list includes classic traditional as well as modern, attention-grabbing trees. 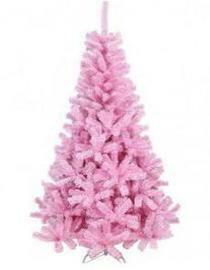 If you want a pink tree for Christmas then this could be the one - it's an impressive 6ft pink Christmas tree from Festive Lights. This tree has a good shape, is quite subtle and has hinged branches with a white metal base. This best selling design has up to 584 tips, a width of 90cm and is easy to assemble with three sections that slot together. It's also available size 7ft for £89.99. The tree looks great against a white background, so if you have light walls try putting some lights behind the tree. A scattering of soft blue lights would work well with touches of gold and silver decorative items. This Christmas tree is also available in purple, orange and cream, at £74.99. White and black versions can be bought for the lower price of £59.99 and £54.99 respectively. 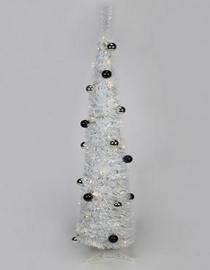 7ft black and white Christmas trees are also available. If you're looking for a different coloured tree and/or at a cheaper price, Festive Lights have a 3ft artificial tinsel tree available in bronze, copper, fuchsia, silver and Turquoise; priced at just £14.99. Festive Lights offer free UK delivery on orders over £50. Some Christmases all you want is a small non-fussy tree to display on a table or in a window. If that's you this year then this cute 2ft Christmas tree by Festive Lights is just right. It's ready to go with red berries and isn't lacking in detail. Although small, decorations can be hung on it too. 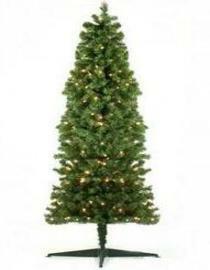 This table top Christmas tree has a realistic artificial design, 160 tips and is ideal for homes with little space. The base is worth mentioning, it's a charming round log shape wrapped in coarse hessian with a gentle bow. 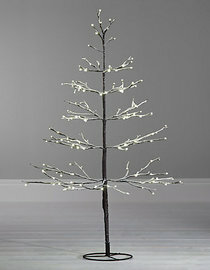 John Lewis' 4ft pre-lit snowy twig tree is a must for a the perfect fairy tale themed Christmas. It is stunning to look at just as it is but when the lights are on and in a dark setting it's even better. The detail of the snow and realistic branches is superb. It's easy to create a minimal look indoors or outdoors with this twig Christmas tree, there's no need to decorate but of course you can if you want. It has 160 lights, weighs 1.3kg, is made with polyethylene and has a sturdy metal base. The tree is easy to assemble with the pieces slotting together and pre-assembled branches that drop into place. John Lewis offer free standard delivery within five days or you can pay for faster delivery. Alternatively, collect your tree from any participating John Lewis or Waitrose store on Mondays 2pm onwards. If you're looking for a simple artificial tree at a great price, this 6ft classic woodland pine Christmas tree could be right for you. B&Q's woodland pine is made from PVC, has great shape and is full and bushy. This tree is excellent value for the price and can be used year after year. 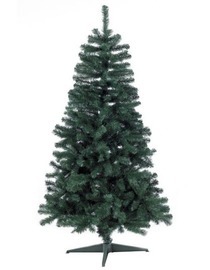 This green artificial tree is 950mm wide, weighs 4kg and has a four point plastic base. It is very easy to set up and importantly is fire resistant. B&Q recommend using 240 lights on this tree. B&Q offer next day UK delivery when ordering by 7pm Monday to Saturday, 2pm on Sundays. A slim line Christmas tree could be ideal for a narrower display area and is different to classic shaped trees. Festive Lights' 6ft white pre-lit slim line pop up tree takes up little room and conveniently has integrated warm white LED lights and stylish black baubles. It has a slim cone shape with a wrapped tinsel design. 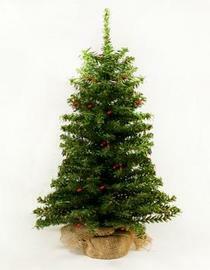 This pop up Christmas tree is easy to 'pop up' in any indoor space. It has 80 LED lights, a three point plastic base and a three meter dark green cable. The power source is low voltage. The same tree is also available in green with red and gold baubles and warm white lights. Choosing a real tree each Christmas will insure you have an unique tree every year, allowing you to enjoy the natural smell and tweak your style each year. 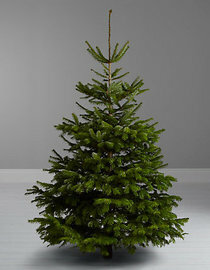 This John Lewis Nordmann fir real tree is a lovely fresh green colour, full and well shaped with strong, bushy branches. The soft, dense needles which have great retention make this Christmas tree a top choice for a real indoor tree. Your Nordmann fir will be a minimum of 6ft high but natural variation means it could be up to 7ft high. It will be between 4-5ft wide. John Lewis' Nordmann firs are grown sustainably, freshly cut from Scotland and delivered straight to your door. Within 24 hours of your order John Lewis will contact you to arrange free delivery, between 28 November and 24 December 2014. 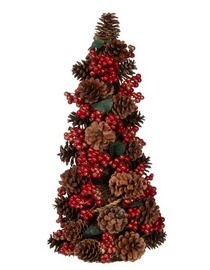 Table top Christmas trees are the easiest, non-fuss way to decorate your home and this 1.5ft pre-decorated pine cone tree by B&Q ticks all the boxes. Place on a table or a window sill in your home for instant Christmas warmth that comes from the rich cones and winter berries this tree is made from. It has a diameter of 150mm and has dark green leaves poking through in places. Order from B&Q by 7pm Monday to Saturday (2pm on Sundays) to get next day UK delivery. Alternatively, collect it yourself the next day at a B&Q store. Give your home a cosy, vintage feel for Christmas with this 7ft blue Christmas tree by John Lewis. 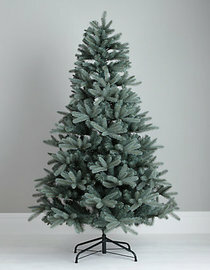 It's a quality artificial pine tree with a gorgeous look and hard wearing branches, realistically finished in a pastel green shade with a blue hue. Gold baubles with a matt finish would work well on this tree. This 7ft tree will stand proud in your home, it has a 127cm wide base, weighs 14kg and is made with polyethylene and has PVC tips. It is easy to assemble with the pieces slotting together and pre-assembled branches that can be arranged into place. Free standard delivery within five days or pay for faster. Alternatively, collect from a John Lewis or Waitrose store. You don't usually see half a Christmas tree and the thought of having one, with the back half missing, may have never crossed your mind. A 'half tree' is a great idea for small spaces and can be used as a cool display, especially with a few trees lined up along a feature wall. Half-trees are also popular features for a small shop display. Festive Lights' 6ft half tree is pre-lit with 130 warm white mini filament lights, adding to the ease and usability of the tree. This half Christmas tree is fairly slim and has 500 tips, is easy to assemble with a three point plastic base and a five meter dark green cable. It's possible to decorate outdoors this Christmas without blinding your neighbours with thousands of lights, reindeers and snowmen. How about just two simple boxwood Christmas trees either side of your front door with a splash of twinkle around the place? 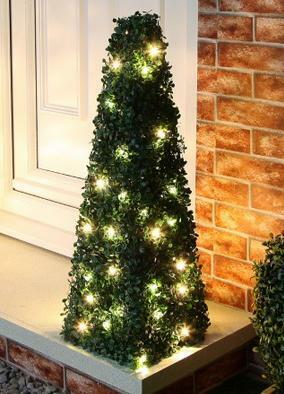 At Festive Lights you can buy a set of two stylish boxwood trees with integrated LED lights that are suitable for both outdoor and indoor use. These green boxwood Christmas trees are 75cm in height and 25cm wide, taking up little space. They have 50 bright warm white LED lights that shine brighter than filament bulbs and last longer too. Both trees come with a five meter dark green cable and run on low voltage power.